Torsional Vibration Dampers (TVDs) provide vital protection for a vehicle’s engine, absorbing excessive vibrations that could cause damage to surrounding components. Corteco runs through how to successfully remove and install a replacement TVD. TVDs help to absorb excessive vibrations leaked from the engine which, if transmitted, could damage surrounding components leading to their premature failure. The belt routing can be quite complex so we advise that you make a record of this in its original position. Next you need to remove the tensioner from the belt. This can be easily done by rotating the pulley. To remove the TVD from the crankshaft you need to loosen the mounting bolts. If the TVD you are replacing has a central expansion bolt then you will need to block the flywheel. If the TVD you are replacing doesn’t have a central bolt then it can be removed by holding the pulley and removing the mounting bolts. As always, we recommend that all bolts are replaced with the TVD. Corteco offers complete TVD kits to make this possible. Unpack the new damper and place this on the engine. Tighten the mounting bolts. If there are several bolts, we recommend tightening alternate bolts and working them in a star pattern. Torque the mounting bolts to 1/3 of the installation torque. Before fully tightening the bolts we recommend you torque the mounting bolts to 2/3 and then continue to tighten them to the full torque as specified by the vehicle manufacturer in the manual. Inspect the front end auxiliary drive for wear and replace any parts that are showing significant signs of stress. The final step of the installation and removal process is reloading the belt onto the tensioner by rotating the tensioner to the correct position. 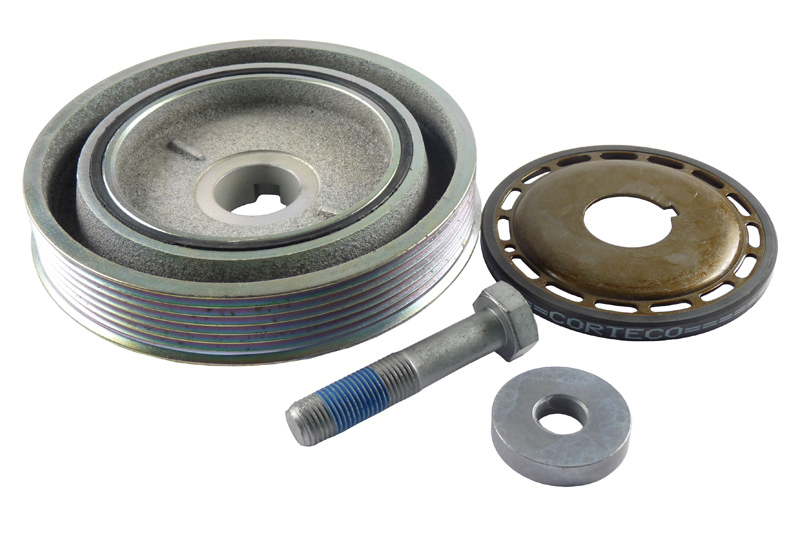 As a pulley replacement is seen as a crucial repair, only quality products should be used. 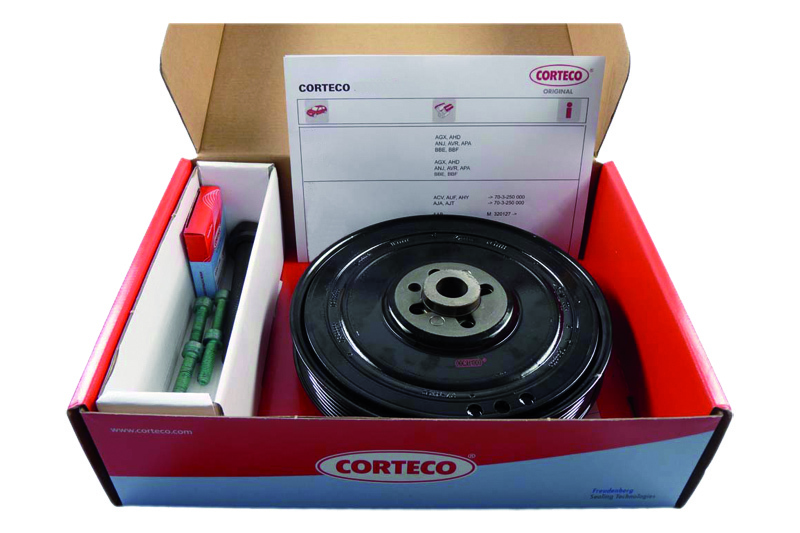 Corteco offers a lifetime warranty on all TVD kits, as we know they will not let you down. To find out more about Corteco’s extensive range, click here.